After the Cambridge Analytica exposé, Facebook’s use of your personal data to make money is in the spotlight. While it’s common knowledge that Facebook makes money through advertisements, not many people know that the company provides access to an extensive trove of data on you to advertisers and even third-party apps on Facebook. The next time you take a “personality test” quiz, be aware that it could just be a shady operation run by a company looking to influence crucial decisions such as the party you vote into power. This makes your personal data a weapon in elections - or something more mundane as a “buying decision” - and you have every right to stop that from happening. If you want to stop this kind of surveillance entirely, you might want to delete your Facebook account entirely, and perhaps even delete your WhatsApp and Instagram accounts. If that is not an option, then follow these steps to limit how much of your data third-party apps can use. If you are using the Facebook website on desktop or mobile. Go to Facebook’s app settings page. Below Apps, Websites and Plugins, click Edit. Open the app and tap the three horizontal lines icon on the top-right. Open the app and tap the three horizontal lines icon at the bottom-right. 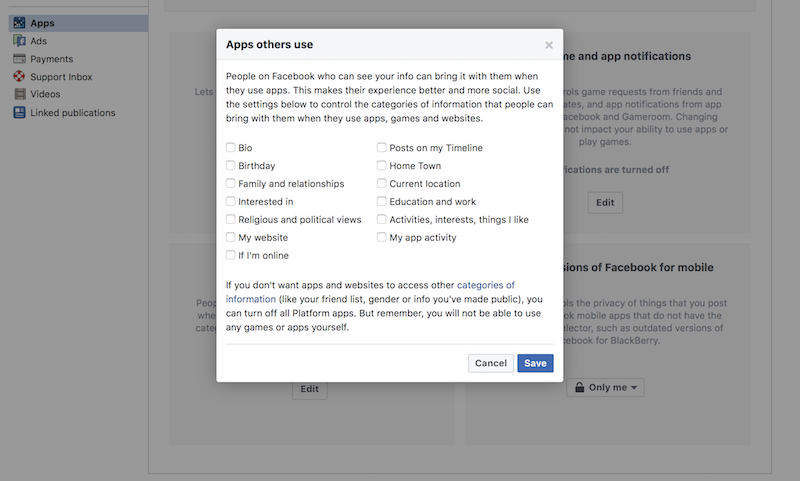 This will remove all third-party apps from your Facebook profile. Note that this can have an effect on how you use other apps. 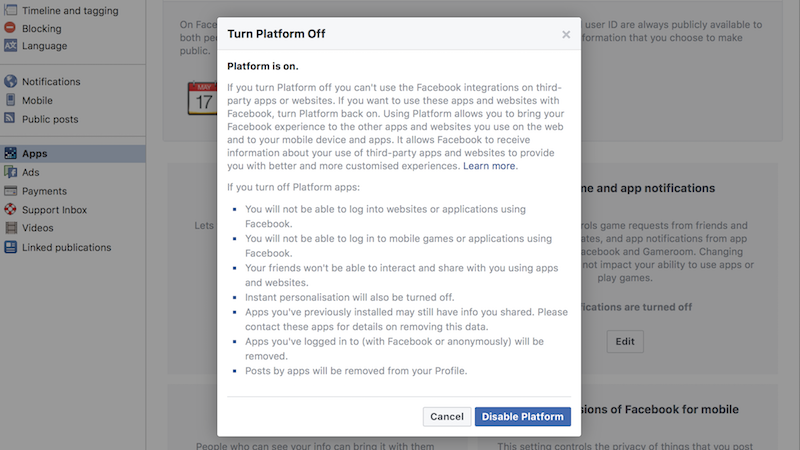 For instance, if you use Facebook to sign in to apps or websites, this will disable that. You will have to reset your password on all these apps and websites. You will also lose access to any apps on Facebook that you may use. Go to Facebook’s app settings page on the website. Click Edit. Here you can see the true extent of surveillance on Facebook. Even if you don’t allow apps to use your information, your friends can unwittingly share your personal data with third-party apps. This includes information including birthday, family and relationships, app activity, and even whether you are online. Uncheck everything and then click Save. This will quickly limit the amount of information you share with Facebook. Remember that you can use Facebook Messenger without a Facebook account in case you need to keep in touch with some people on the social networking website. You can also limit the information you share with Facebook’s advertisers. If you are using a mobile browser or using Facebook on desktop, follow these steps. 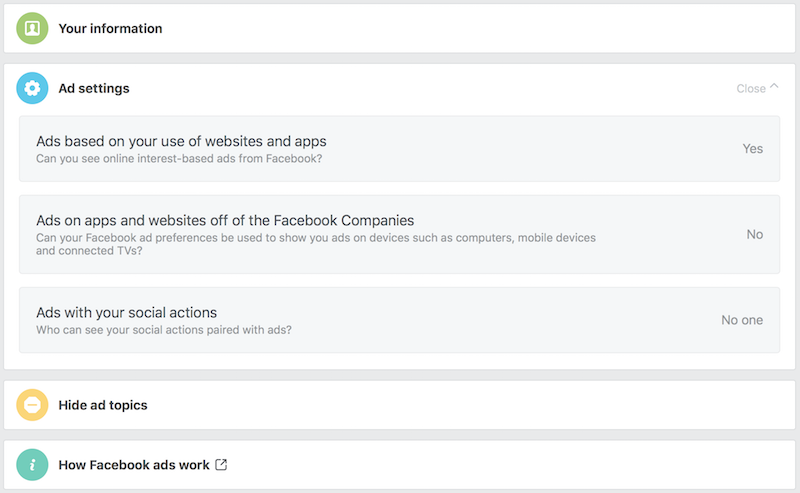 Go to Facebook’s ad settings page. Then tap Ads based on my use of websites and apps and then Off. Then tap Ads on apps and websites off of the Facebook Companies on the previous page and tap No. Tap Adverts with my social actions and tap No one. If you use Facebook on Android, follow these steps. TapAds based on my use of websites and apps and then Off. Open the app and tap the three horizontal lines icon on the bottom-right. Tap Ads based on my use of websites and apps and then Off.